This is an insider’s view of days of mob violence in late Georgian London. Laetitia Hawkins was more or less in the middle of things and her father, Sir John, was a local magistrate and thus responsible for trying to restore order. 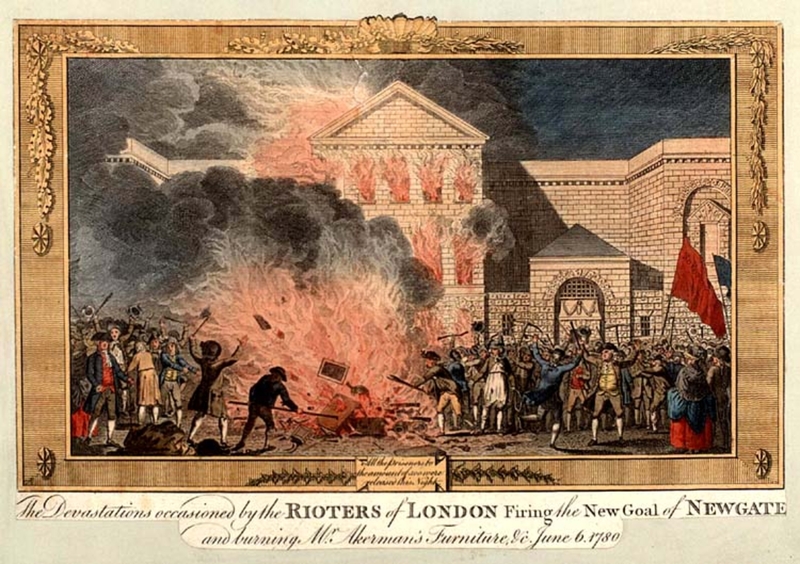 The riots were caused when Lord George Gordon, a man of violent and unstable temperament, stirred up the mob to demand the repeal of the Catholic Relief Act of 1778 and a return to the repression of Catholics. However, they seem to have tapped into a more general vein of frustration and anger amongst the lower classes. Trouble began when, on 2 June, 1780, Gordon headed a march by 60,000 to the House of Commons to present a petition against the act. Things slipped out of control and violent riots ensued in London, lasting for several days. Despite the cries of ‘No Popery!’, destruction went well beyond Catholic targets. Anyone thought to be antagonistic to the crowd’s demands was seen as fair game. … his house was sacked and destroyed in an incredibly short space of time. One of the young ladies of his family stayed there until she saw her grand pianoforte thrown on a bonfire made of the books and furniture, together with a large silver tankard containing guineas! Next Sir John was called to the Duke of Northumberland’s house in Charing Cross. There he had better luck and less interference. Again some Guards arrived. This time they were placed where Sir John wanted them: in the courtyard, facing the way the mob would have to come. As a result, the rioters were driven back and the house saved. Next morning, Sir John went back home, only to find his own home under threat! … the parish curate came in to tell us that our house was doomed, and sure enough its street door was marked with the figure 8, which portended destruction. We, therefore, set to work removing our furniture, clothes, books and pictures to a neighbour’s house, kindly placed at our disposal, and left our own stripped of every-thing but bedsteads and fixtures. We then drove to Clapton, where some friends had offered an asylum, passing en route the Hampshire Militia which was marching along the New Road with a train of artillery. That night I counted seven conflagrations lighting up the sky of London; it was an appalling sight! Eventually the riots were brought under control. However, it appears this series of events frightened the ruling elite enough to ensure that, when the French Revolution broke out nine years later, those in power in Britain were prepared to resort to Draconian—and sometimes illegal—methods to clamp down on any threat of mob violence spreading across the Channel. Whether that was ever a real possibility is far from clear, but the experience of the Gordon Riots seems to have been enough to cause the government to take no chances.